All I want for Christmas is...soup. After having several chilly, dreary days, all I really want to think about eating is SOUP. I've compiled a quick list of some of my favorite soups in DFW: Check 'em out and please comment with more suggestions! 1. 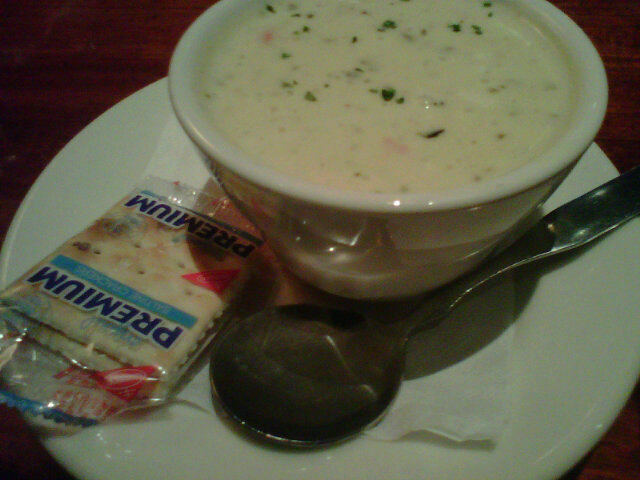 Roasted jalapeno cream soup at Rockfish(seen below in photo). This creamy, spicy soup serves up a perfect mix of heat and flavor. 2. An old favorite of mine that you can find all over the country is Panera's Broccoli Cheddar soup: Chopped broccoli, shredded carrot and select seasonings simmered in a velvety cheese sauce. 3. Sip & Savor: Butternut Squash Soup: fresh, crisp butternut squash flavor blended with a touch of ginger. 4. the Smiling Moose: Spicy Chicken Enchilada - this stuff isn't for the weak of palate, it is Spicy for real. Nasal dripping, eye watering spicy. But worth it, for the flavor. 5. Pho que huong:Vietnamese beef noodle soup (huge serving for only 6 bucks) is flavorful, comfort-inspiring, and warming from head to toe. I love this stuff even though I make a huge mess of myself eating it. 6. Reata:Jalapeno and Cilantro Soup. Think chicken tortilla soup, but fancier and with authentic, creative flair. And vegetarian friendly, I believe. 7. Turtle Soup at Perry's Steakhouse & Grille: creamy, delicious, and made from Louisiana snapping turtle. Pretty cool, huh? 8. Mushroom Soup at the Grape: It's legendary and rightfully so. Perfect blend of butter, white wine, mushrooms, onions, and cream. 9. French Onion soup at Kenny's wood fired grill: the best part is the cheese. Mmmmmm. 11. Wonton Noodle soup at First Chinese BBQ: Add chili oil for a spicy treat. 12. Tomato Bisque at Hattie's: with a mini grilled cheese garnish! Perfection in a bowl! 14. Pappas bros' Lobster bisque: They don't skimp on lobster, you get a huge serving of it, and the overall flavor just exudes seafood greatness. My favorite lobster bisque thus far in life. 15. Clam Chowder at Oceanaire: I'm not normally a huge clam chowder fan, but it's pretty much world-famous at the Oceanaire, so I had to indulge. That little cup of soup won me over. It was chock-full of clams that were fresh and not too fish-y like the type I've had at other "seafood" restaurants. Good, creamy chowder. 16. Tom yum at Best Thai: Authentic, spicy, healthy. Happiness in a bowl, prettymuch. 18. Seafood soup at Mesa: Rich with clams, mussels, shrimp and crab. Pretty amazing stuff. Welp, friends, now that I'm sufficiently hungry again, it's time to venture out and find some more great Dalllas soups to brag about for next time.